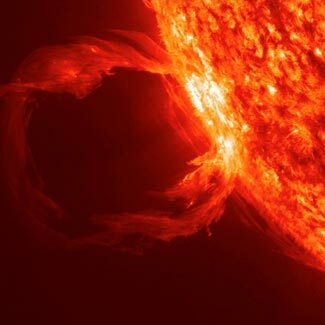 This NASA image hints at the awesome power of the sun – power which could potentially destroy our electricity grid. Up front disclaimer – we don’t think that our power grid will fail this coming weekend. But – and here’s the thing that applies to all prudent prepping – we don’t know for sure, one way or the other. Anything that is unknown but possible is exactly that – a possibility, and we need to keep all possibilities in mind and assign varying degrees of priority to the risks they represent and the appropriate way to mitigate their potential risks. As we pointed out on Wednesday, the sun is entering a period of potentially peak cyclical activity, and additionally is experiencing some unusual changes to its underlying magnetic poles. Underscoring our comments, on Thursday an ‘extreme solar flare’ erupted on Thursday (reported here and elsewhere). And as we pointed out a couple of months back, experts predict there is a 12% chance of a catastrophic failure of our national electricity distribution grid, as a result of solar storm induced issues, some time in the next ten years. It seems reasonable to assume that this risk will be concentrated more on the next two or three years of maximum solar activity, rather than the years after that as activity drops down again. So, there’s a real risk, and it applies to the next few years. Now for more worrying news. The experts themselves don’t seem to understand exactly what might happen, when, how or why. This article points out that NOAA and NASA can’t get their stories straight about the strength of current solar storm headed our way, or when it might arrive. That is worrying. They both start off with the same source data, but can’t reach similar conclusions. Are they experts or amateurs? It is like they were both given the same problem ‘If two boys have ten apples between them, and A has four apples more between them, how many apples does B have’ and come up with different answers. The reason for the confusion is that there’s a lot less exact science in the field of understanding solar flares than we’d hope for. The math problem perhaps reads, instead, ‘If two boys have something kinda sorta like ten or so apples between them, and if A has a handful more than B, how many apples does B have’. And they are given a blurry photo of the two boys but it is hard to make out the shapes of the apples. So here’s a risk that we know too little about, but which we do know could destroy our modern world, and not only do we know it could do this, we accept there’s actually a measurable significant chance that it will do this. Amazingly, most of the world finds this level of ignorance reassuring. That’s a bit like the ostrich that buries its head in the sand, isn’t it. More prudent people find such uncertainty alarming, and choose to focus on somewhere between a realistic and a negative outcome to plan what to do. If you’d like to know more about the very complicated field of solar conditions and ‘weather’ here’s an interesting starting point on NASA’s site. And here’s an article from 2010 that presciently says that solar storm behavior can surprise forecasters. The bottom line? Well, no-one really knows for sure. But you’d be well advised to prepare for trouble.